I think by now you guys know how much I completely love sugar cookies! They are hands down my most baked cookie because they are just so darn easy to make! Plus I spent literal years trying to perfect my sugar cookie recipe, so I’m pretty committed to a good sugar cookie! The best thing about sugar cookies (besides they’re amazing flavor) is how versatile they can be. 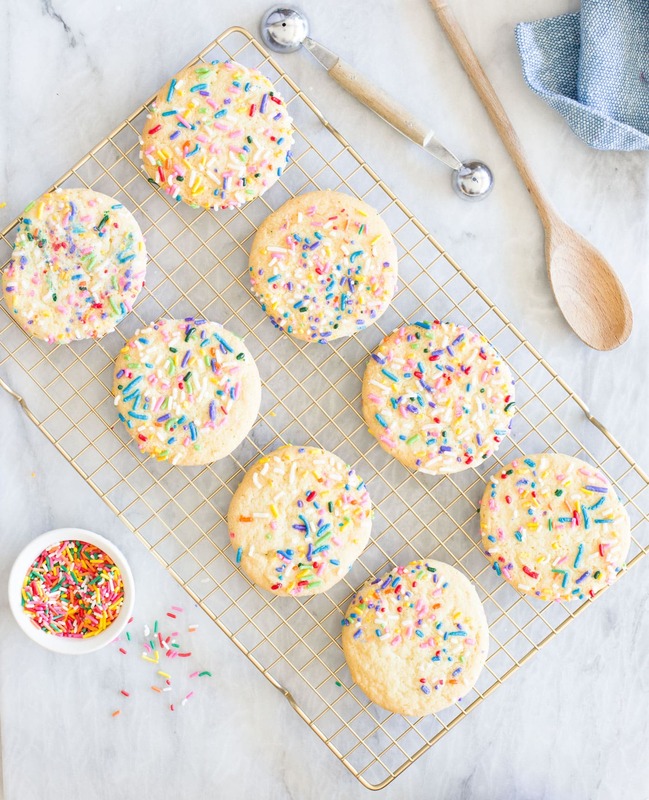 Sugar cookies are perfect just as they are, decorated for an event, or used as the delicious outsides of an ice cream sandwich. 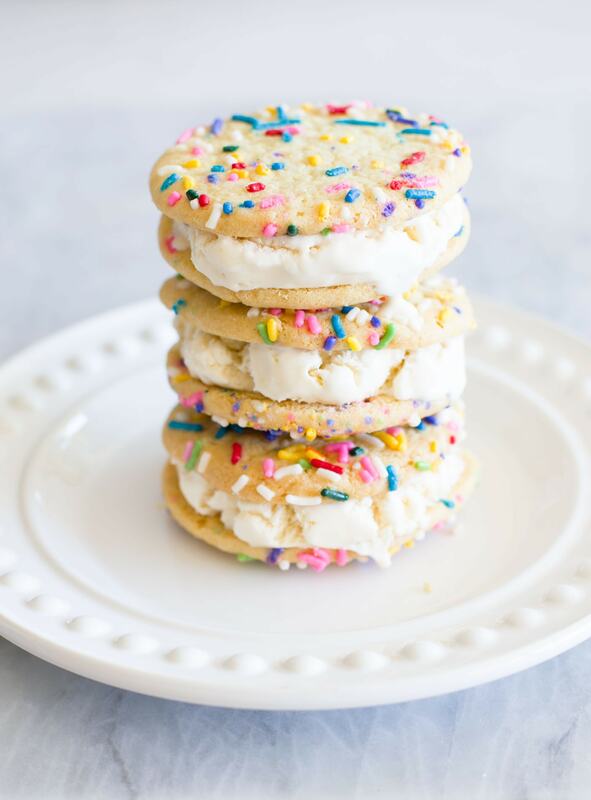 ;) Seriously the slight chewiness of a good sugar cookie with its signature sweetness is perfect to build an ice cream sandwich! For this recipe, we added just a little extra touch. ;) By gently folding in sprinkles right to the dough, your cookies will be a little sweeter and a lot more fun! ;) What’s not to love about that? 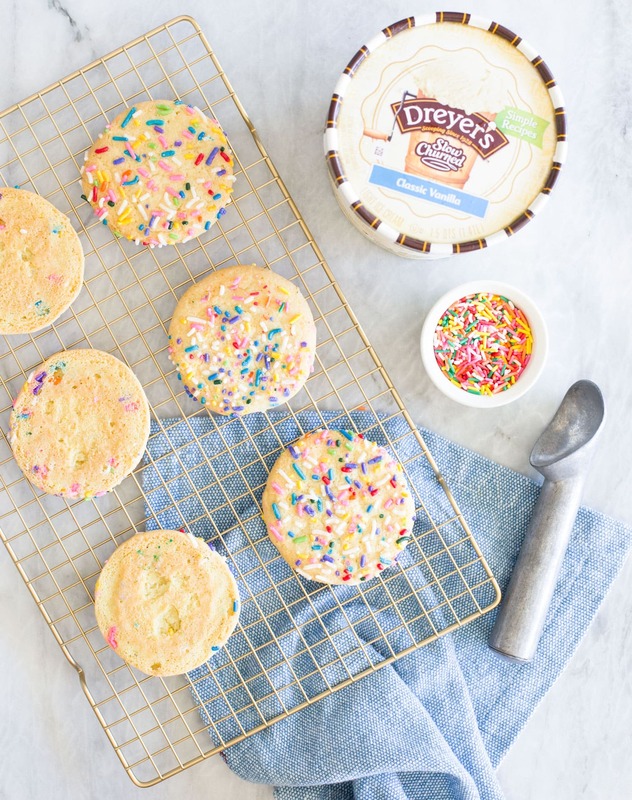 If you’re in a time crunch and do not have time to make my sugar cookie recipe, you can always go to the store and grab baked cookies and add Dreyer’s Slow Churned Vanilla ice Cream to your cookies. 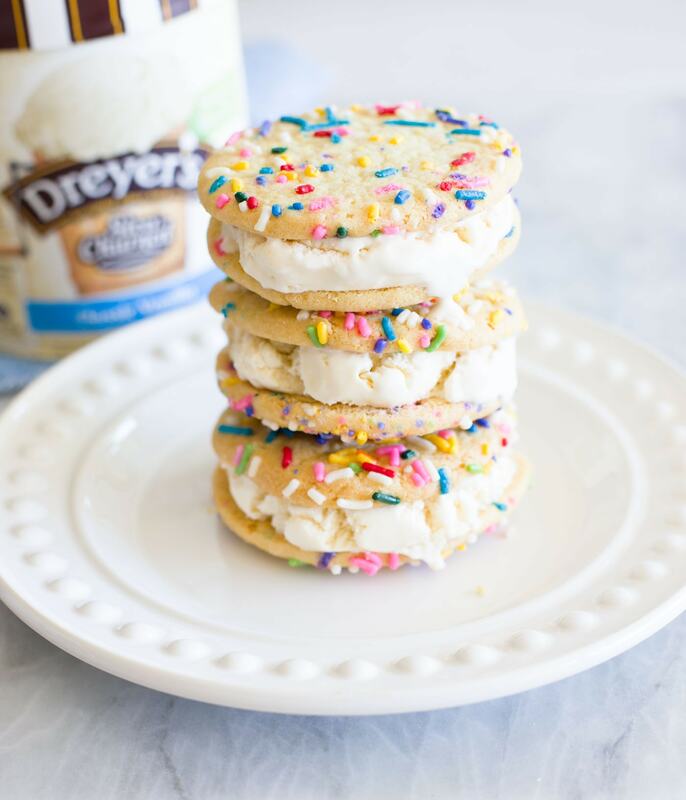 This Sprinkle Sugar Cookie Sandwich with Dreyer’s Slow Churned Classic Vanilla Ice Cream is about to be your new favorite summer dessert! Seriously! We’ve been making it summer after summer and it never disappoints! Do you have any summer dessert traditions? Spill the sprinkles and leave me a comment! 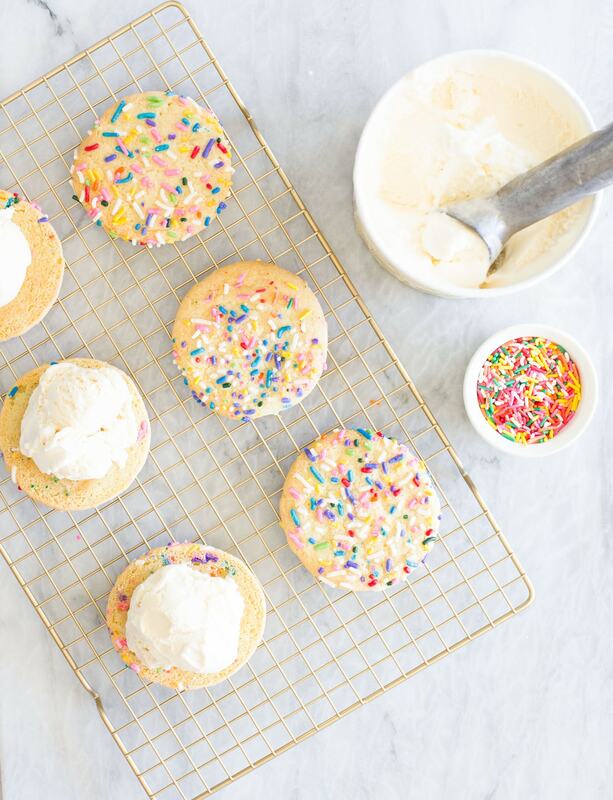 Place round cookie dough scoops onto a cookie sheet, and sprinkle with additional sprinkles. Allow cookies to cool for approximately 20 minutes. Place a single scoop of Dryers Slow Churned Classic Vanilla Ice Cream on half of the cookies, top with an additional cookie. You can either serve immediately or place cookies back in the freezer to set. Disclosure: This blog post has been sponsored by Nestle. All opinions are my own. Thank you for supporting the brands who support BFFF. These look beautiful AND delicious! 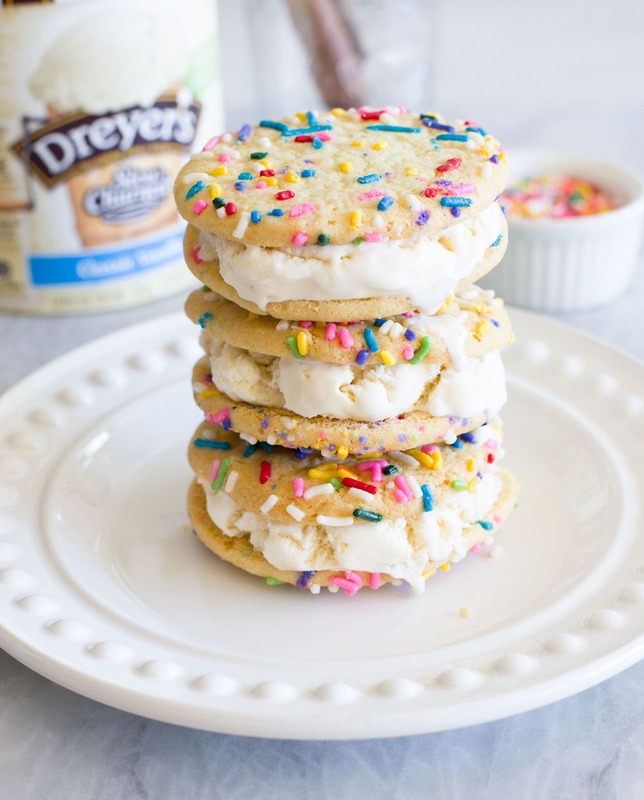 I’m a huge fan of cookies and ice cream sandwiches, though I’ve never made the latter before, but this is really inspiring me to give it a try ???? I read on Instagram that you started BFFF when your son was 6 months old, and that has made me even more in awe of you! Taking on such a big project when you’re also raising a newborn baby is super inspiring, and is certainly a wake up call that I could probably be doing a lot more with my life than I am currently am ???? Haha! You really did your homework over there. ;) It has always been a juggling act, but somehow everything gets done. =). 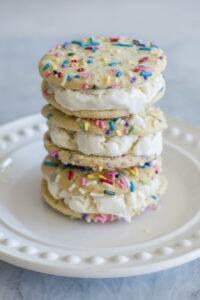 We just love these sprinkle ice cream cone sandwiches. They’re soooo addicting. I hope you try them sometime soon. Oh man! This looks beyond delicious. I am going to make this as soon as possible. Well done! I can’t wait to try this either. My most favorite hobby is trying out new recipes. Since I’m engaged in my work.I don’t get much time now a days to tryout everything posted here but I had tried most of them and almost all came out really tasty at my first try itself.